The retirement lists are available now. 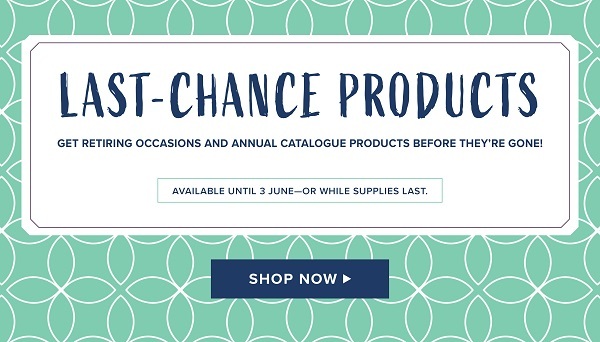 That means select products from the Occasions Catalogue and Annual Catalogue are retiring—and this is your last chance to get them! Check out all the details below. I'll be sending out more details later on the exciting die options in the 2019–2020 Annual Catalogue. I just wanted you to be informed when you saw our old-style die-cutting & embossing machine will be on the retiring list. Retiring In Colours: Powder Pink, Lemon Lime Twist, Tranquil Tide, Berry Burst, and Fresh Fig. In the past, retiring In Colours have sold out quickly so don't wait to get your stash of ink refills, paper, and embellishments. Stampin' Storage - are you as excited as I am?